How Does Cannabis in Breast Milk Affect Child Health & Development? Cannabis (also called marijuana, pot, or weed, among many other terms) is the most commonly used recreational drug among breastfeeding women. Yet there is not enough information to evaluate the effects of maternal cannabis use on children who are being breastfed to determine whether it is safe to use. With the legalization of cannabis for recreational use in 9 U.S. states and the District of Columbia, as well as legalization for medicinal use in 29 U.S. states, now more than ever moms and healthcare professionals need information that will better allow them to assess potential child risks of cannabis exposure through breast milk. Breastfeeding women who participate in our Mommy’s Milk study are not asked to consume cannabis as part of the study; rather, they are already using cannabis and we just ask them if they’d be willing to answer some questions and provide us with a 2 oz. sample of their breast milk. You can be a part of this cutting-edge research! Your contributions will support the collection and analysis of breast milk samples from nursing women across the United States and Canada to help us determine if marijuana passes into breast milk, at what amounts, and if this exposure affects a child’s development, learning or growth. With your help, we can conduct the first large-scale study of cannabis in breast milk. Due to the insufficient data on the amount of cannabis that crosses into human milk, we are currently unaware about the levels of the drug that may accumulate in breast milk, and the potential growth or neurobehavioral consequences for the exposed child. With your generous gift, we can carry out the research that is critically needed to answer the question of whether cannabis use is harmful or harmless during breastfeeding. Your support can help future moms and their healthcare providers learn more about the safety of cannabis use while breastfeeding. UC San Diego is one of the top-ranked public research universities in the nation. UC San Diego School of Medicine faculty rank #1 in the nation in federal research funding per faculty member. UC San Diego ranks 4th in the world in terms of 'citation impact' in science. In fact, four of the top 10 research health science grants awarded to UC San Diego in 2017 were led by Christina Chambers, PhD, MPH, Program Director of Mommy’s Milk. Dr. Chambers studies the impact of drugs, alcohol and other environmental factors on pregnant and breastfeeding women and their babies. This requires her to work with large teams of collaborators from around the nation in new and exciting ways. “It’s not so much a single investigator doing incremental science in the lab. It’s people working in a consortium with multiple sites who need to work together in a collaborative way,” says Dr. Chambers. You can be part of this network of maternal health and child development advocates that funds necessary research. 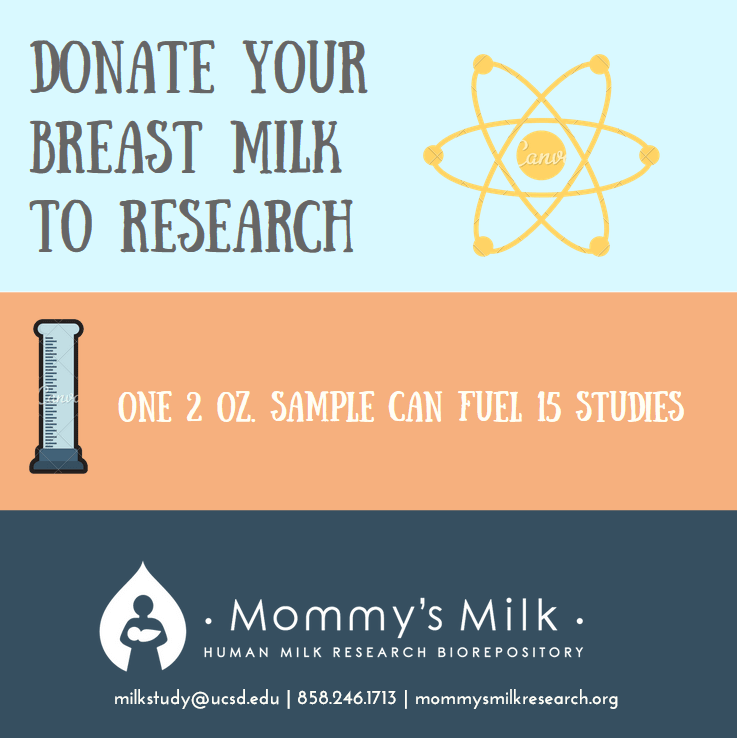 Ever dollar donated will fund breast milk research. The findings of this study are anticipated to be incorporated into LactMed (National Library of Medicine), a resource widely used by clinicians as one of the most authoritative references for information on drugs and other chemicals to which breastfeeding mothers may be exposed. This information can then be used by healthcare providers so they can counsel their patients for the best possible outcomes for both mom and baby. 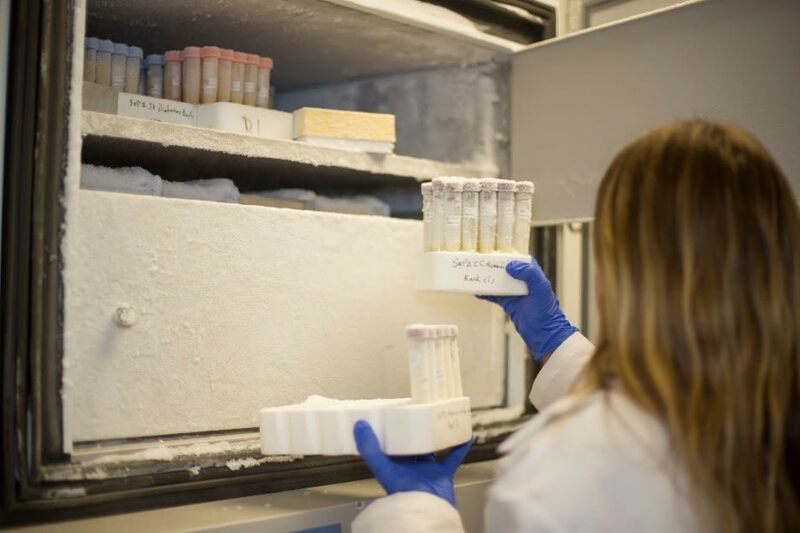 This research is being conducted by Mommy’s Milk Human Milk Research Biorepository, a multidisciplinary research initiative of UC San Diego’s Department of Pediatrics Center for Better Beginnings and the UC San Diego Altman Clinical and Translation Research Institute-Center for Life Course Research, with the support of Rady Children’s Hospital-San Diego, Sharp Mary Birch Hospital for Women & Newborns, and MotherToBaby Pregnancy Studies. The goal of Mommy’s Milk is to understand all aspects of human milk in hope that this will lead to optimal health for mothers and infants. Thank you so much for your gift and support of pediatric research! Help with ongoing research costs. Support 1 participant from start-to-finish. Includes all supplies needed to collect and store a milk sample, costs to ship, process, and analyze the sample, and costs to conduct neurobehavioral testing with the child and analyze the results.